A book that I've long been waiting for has just been released. 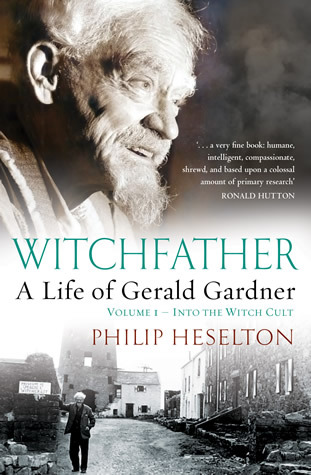 It is a new biography of Gerald Gardner by Wiccan historian Philip Heselton and is now available in electronic format. The printed version is due to follow very shortly. I heard Philip give a lecture at the Charge of the Goddess Conference last year about the life of Gerald Gardner, the father of modern witchcraft. His talk was based on his research for this new book, which is called Witchfather: A Life of Gerald Gardner. The book is actually so long that it has been released in two volumes, and the talk I heard could only offer a few tantalising highlights from it. Publisher Thoth says in its press release about the book: "From the author of the highly acclaimed Wiccan Roots, this is the first full-length biography of Gerald Brosseau Gardner (1884-1964) - a very personal tale of the man who single-handedly brought about the revival of witchcraft in England in the mid 20th Century. "From his birth into an old family of wealthy Liverpool merchants, through an unconventional upbringing by his flamboyant governess in the resorts of the Mediterranean and Madeira, it tells how, having taught himself to read, his life was changed by finding a book on spiritualism. During a working life as a tea and rubber planter in Ceylon, Borneo and Malaya, he came to know the native people and was invited to their secret rituals. But it was only on his retirement to England, settling on the edge of the New Forest in Hampshire, that destiny took him firmly by the hand. Through various twists and turns involving naturist clubs and a strange esoteric theatre, he became friends with a group of people who eventually revealed their true identity – they were members of a surviving witch coven. "One evening in 1939, as the hounds of war were being unleashed, he was initiated into the ‘witch cult’ by these people, who called themselves ‘the Wica’. Gardner was overwhelmed by the experience and was determined that the ‘witch cult’ should survive. This book chronicles his efforts over the remaining quarter century of his life to ensure not only that it survived but that it would become the significant player on the world religious stage that it now is – 'the only religion that England has ever given the world', in the words of Ronald Hutton, Professor of History at the University of Bristol, who calls it '… a very fine book: humane, intelligent, compassionate, shrewd, and based upon a colossal amount of primary research'." I should add that after hearing Philip's talk at the Charge of the Goddess Conference I visited the area on the edge of the New Forest where Gerald Gardner lived. I took quite a few photos of places mentioned in the talk that are almost certainly discussed in greater detail in the book. I delayed posting the photos on a Bad Witch's Blog because I didn't want to pre-empt the release of Witchfather: A Life of Gerald Gardner. Now the book is published, I will dig out my photos and post them on my blog some time soon. I am most of the way through reading this book (it tempted me into my first foray into e-books) and I am totally glued to it. I can't recommend it enough. Every person who has ever thoughtlessly repeated any of the number of laughable "Gerald Gardner myths" out there should be given a copy of this book and made to read it. It humanises him and shows him in a more realistic light. Less as the "inventor" of Wicca and more it's eccentric benefactor. After what I have read I feel like I know more of the the man and more of why the modern Wiccan movement is the way it is.